A Chinese robotic probe has just successfully completed the first round trip to the Moon and back home in four decades that paves the path for China’s next great space leap forward – an ambitious mission to return samples from the lunar surface later this decade. On Saturday, Nov. 1, the unmanned Chang’e-5 T1 test capsule nicknamed “Xiaofei” concluded an eight-day test flight around the Moon by safely landing in Siziwang Banner of China’s Inner Mongolia Autonomous Region, according to a report by the official Xinhua News agency. China thus become only the third nation to demonstrate lunar return technology following the former Soviet Union and the United States. The Soviet Union conducted the last lunar return mission in the 1970s. Search teams with helicopters recovered the “Xiaofei” orbiter intact at the planned landing zone about 500 kilometers away from Beijing. The Chang’e-5 T1 test mission is an unequivocally clear demonstration of China’s mounting technological prowess. Chang’e-5 T1 served as a technology testbed and precursor flight for China’s planned Chang’e-5 probe, a future mission aimed at conducting China’s first lunar sample return mission in 2017. “Chang’e-5 is expected to collect a 2-kg sample from two meters under the Moon’s surface and bring it home,” according to Wu Weiren, chief designer of China’s lunar exploration program. The ability to gather and analyze pristine new soil and rocks samples from the Moon’s surface would be a boon for scientists worldwide seeking to unlock the mysteries of the solar system’s origin and evolution. “Xiaofei” was launched on Oct. 23 EDT/Oct. 24 BJT atop an advanced Long March-3C rocket at 2 AM Beijing local time (BJT), 1800 GMT, from the Xichang Satellite Launch Center in China’s southwestern Sichuan Province. It was boosted on an 840,000 kilometer, eight-day mission trajectory that swung halfway around the far side of the Moon and back. It did not enter lunar orbit. During its path finding journey, “Xiaofei” captured incredible imagery of the Moon and Earth, eerie globes hanging together in the ocean of space. A unique view of the Moon and distant Earth from China’s Chang’e-5 T1 lunar test flight. Image via CCTV News and UnmannedSpaceflight.com. The probe was developed by the China Aerospace Science and Technology Corporation. The service module is based on China’s earlier Chang’e-2 spacecraft. On its return, the probe hit the Earth’s atmosphere at around 6:13 a.m. Saturday morning at about 11.2 kilometers per second for reentry and a parachute assisted soft landing in north China’s Inner Mongolia Autonomous Region. The goal was to test and validate guidance, navigation and control, heat shield, and trajectory design technologies required for the sample return capsule’s safe re-entry following a lunar touchdown mission and collection of soil and rock samples from the lunar surface – planned for the Chang’e-5 mission. “To help it slow down, the craft is designed to ‘bounce’ off the edge of the atmosphere, before re-entering again. The process has been compared to a stone skipping across water, and can shorten the ‘braking distance’ for the orbiter,” according to Zhou Jianliang, chief engineer with the Beijing Aerospace Command and Control Center. China hopes to launch the Chang’e-5 mission in 2017 as the third step in the nation’s ambitious lunar exploration program. The first step involved a pair of highly successful lunar orbiters named Chang’e-1 and Chang’e-2 which launched in 2007 and 2010. The second step involved the hugely successful Chang’e-3 mothership lander and piggybacked Yutu moon rover which safely touched down on the Moon at Mare Imbrium (Sea of Rains) on Dec. 14, 2013 – marking China’s first successful spacecraft landing on an extraterrestrial body in history, and chronicled extensively in my reporting here. See below our time-lapse photo mosaic showing China’s Yutu rover dramatically trundling across the Moon’s stark gray terrain in the first weeks after she rolled all six wheels onto the desolate lunar plains. The complete time-lapse mosaic shows Yutu at three different positions trekking around the landing site, and gives a real sense of how it maneuvered around on its 1st Lunar Day. 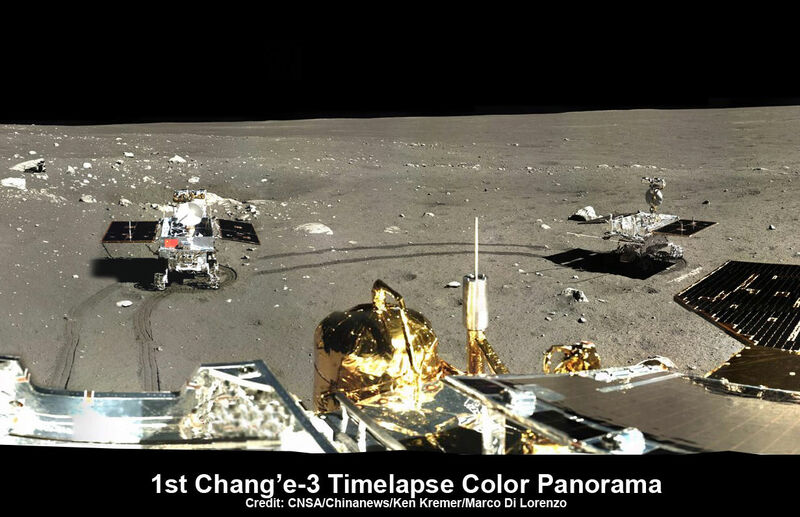 The 360 degree panoramic mosaic was created by the imaging team of scientists Ken Kremer and Marco Di Lorenzo from images captured by the color camera aboard Chang’e-3 lander and was featured at Astronomy Picture of the Day (APOD) on Feb. 3, 2014. China’s space officials are currently evaluating whether they will proceed with launching the Chang’e-4 lunar landing mission in 2016, which was a backup probe to Chang’e-3. Although Yutu was initially successful, it encountered difficulties about a month after rolling onto the surface which prevented it from roving across the surface and accomplishing some of its science objectives. China is pushing forward with plans to start building a manned space station later this decade and considering whether to launch astronauts to the Moon by the mid 2020s or later. Meanwhile, as American lunar and planetary missions sit still on the drawing board thanks to visionless US politicians, China continues to forge ahead with no end in sight.